CBSE Class 12 History Sample Paper (along with Marking Scheme & Hints) for CBSE board exam 2018 is available here. With this article, students can download the paper in PDF format. This Sample Paper is very important for understanding latest examination pattern. CBSE Sample Paper for 12th History board exam 2018 is available here. Students can download the complete CBSE Class 12th History Sample Paper (with Hints and Marking Scheme) with the help of download link given at the end of this article. This Sample Paper is recently released by CBSE. CBSE Class 12 History Sample Paper 2018 is released by the board along with marking scheme and hints. This Class 18 History Sample Paper 2018 helpful in understanding the latest examination pattern and the level of questions which can be asked in the coming CBSE class 12 History board exam 2018. Students must solve this sample paper and refer their solutions with the marking scheme to assess their preparation level of CBSE class 12 History board exam 2018. All the questions of CBSE sample paper for class 12 History are very important for the coming CBSE board exam 2018. (1) Answer all the questions. Some questions have choice. Marks are indicated against each question. (2) Answer to questions no. 1 to 3 carrying 2 marks should not exceed 30 words each. (3) Answer to questions no. 4 to 9 carrying 4 marks should not exceed 100 words. Students should attempt only 5 questions in this section. (4) Question 10 (for 4 marks) is a value based question and compulsory question. (5) Answer to questions 11 to 13 carrying 8 marks should not exceed 350 words. (6) Questions 14 -16 are sources based questions and have no internal choice. (7) Question 17 is a Map question includes ‘identification’ and ‘location’ test items. Attach the map with the answer sheet. A. How was the spirit of secularism drawn from the acts of Gandhi ji during partition? Cite any one example. B. How is the value of secularism relevant to resolve communal problems in contemporary India? You will happily along with the wise and heroic Pandavas … There is no good in a war, no law (dharma) and profit (artha), let alone happiness; nor is there (necessarily) victory in the end – don’t set your mind on war … Duryodhana did not listen to this advice and fought and lost the war. The highest caste are the Brahmana, of whom the books of the Hindus tell us that they were created from the head of Brahman. And as the Brahman is only another name for the force called nature, and the head is the highest part of the … body, the Brahmana are the choice part of the whole genus. Therefore the Hindus consider them as the very best of mankind. The next caste are the Kshatriya, who were created, as they say, from the shoulders and hands of Brahman. Their degree is not much below that of the Brahmana. After them follow the Vaishya, who were created from the thigh of Brahman. The Shudra, who were created from his feet . . . Between the latter two classes there is no very great distance. Much, however, as these classes differ from each other, they live together in the same towns and villages, mixed together in the same houses and lodgings. The view of the country is exceedingly fine, the cultivation, especially the narrow valleys of rice winding in all directions, the cleared lands with scattered trees, and the rocky hills are in perfection; all that is wanted is some appearance of progress in the area and a vastly extended and improved cultivation, of which the country is highly susceptible. Plantations of Asan and Palas, for Tessar (Tassar silk worms) and Lac, should occupy the place of woods to as great an extent as the demand will admit; the remainder might be all cleared, and the greater part cultivated, while what is not fit for the purpose, might rear Plamira (palmyra) and Mowa (mahua). 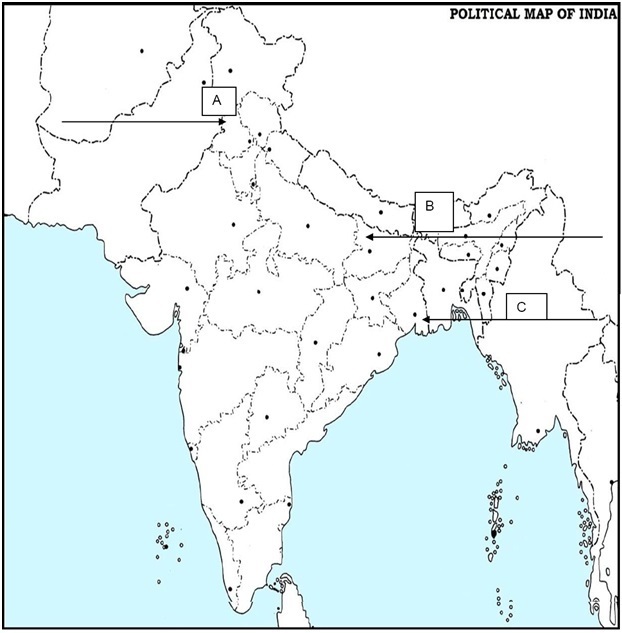 17.2: On the same outline map of India, three places related to The Indian National Movement have been marked as A, B and C. Identify them and write their correct names on the lines drawn near them.